Thirty years ago today was a big, big day for the Madison La Follette classes of 1982 through 1985. At 7:35 p.m., La Follette tipped off against Stevens Point for the WIAA Class A boys basketball championship, before a packed UW Fieldhouse and a statewide television audience. I played in this game. Trumpet, to be precise. This was during a period in my life when it seemed as though all was right with the world, even though I probably didn’t appreciate that at the time. I was doing well (though not well enough according to my parents) in school, specifically enjoying three classes, Wind Ensemble, Journalism and Political Science. I was making the grand sum of $3.35 per hour busing tables at Bridgeman’s Ice Cream Parlour and Restaurant for 15 or so hours each week. That earned me enough money to put gas in the 1975 Chevrolet Caprice my mother and I shared, and go out on dates with my first girlfriend. 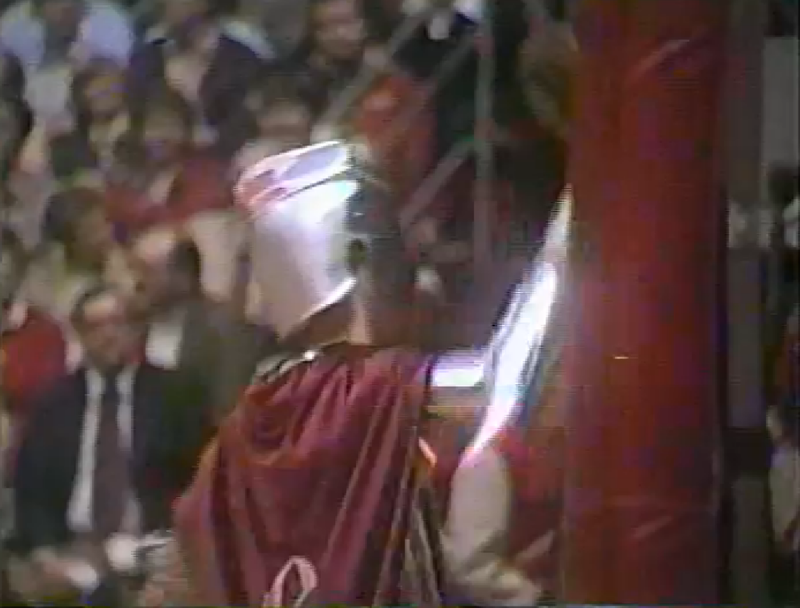 La Follette in the early 1980s was known as a basketball school. The Lancers won their first state championship in 1977, when they proved the adage that how you finish the season is much more important than how you start. La Follette had finished the regular season 10–8, with more than their share of close losses among those eight losses. But thanks to seemingly never missing shots from the field, the Lancers defeated Milwaukee Tech 55–48, Neenah 46–43 and Eau Claire Memorial 65–48 to win their first state title, setting state tournament records for shooting in the process. Upon seeing this photo of Coach Pete Olson, one of my sons asked why he was mad. I had to tell him that this was pretty much the way he always looked. The Lancers won their first regional game easily, then had to endure a nailbiting 64–62 win over Stoughton in a game I couldn’t go to because I had to work. Since high school games weren’t on the radio in Madison, I didn’t find out the result until fans from the game started coming in and remarked what a great game it was. That nailbiting experience didn’t compare to what happened six days later, with La Follette hosting West in a sectional semifinal. Looking up the Wisconsin State Journal story on the game revealed my incomplete memory of the game. I had thought all these years that La Follette had trailed by nine points with 2:30 remaining and scored the last 10 points to win. The truth was more harrowing — La Follette trailed 59–51 with 90 seconds left. In the era before the three-point shot, that’s a four-possession lead unless you can compel your opponent to foul you while you hit a basket. 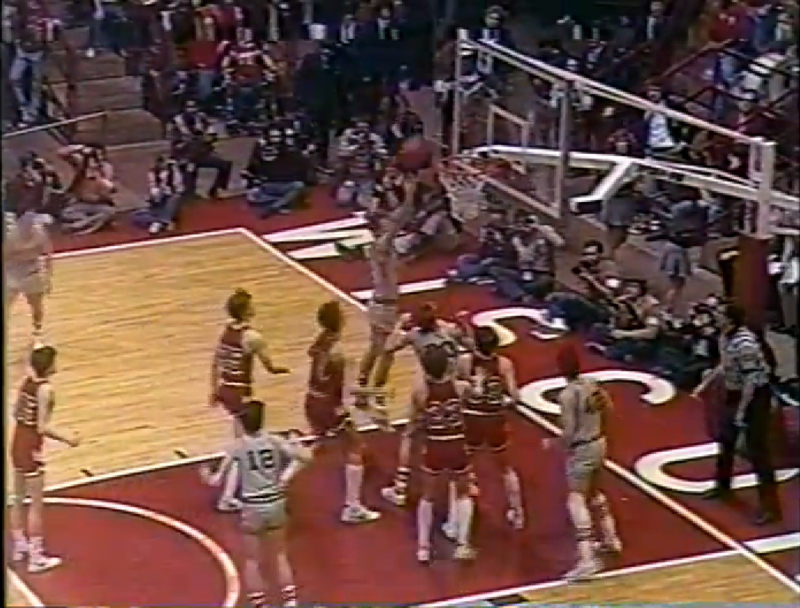 Helpfully, a three-point play by fellow Class of ’83 member Brad Thering cut the lead to 59–54. Rick Olson, over whom college basketball coaches were salivating because of his shooting range that started in the parking lot outside the gym, stole a pass and scored to cut the lead to 59–56. Right in front of the La Follette band, then, a West basket was disallowed for a foul on the rebound. Two more free throws by former La Follette White freshman teammate Steve Amundson cut the lead to 59–58. By this time, the noise in the gym, which started incredibly loud, was in danger of knocking all the stuff on the walls, including the 1977 state championship megaplaque, off the walls. People were actually crying in the gym from the intensity of the moment, seconds from having your season end or getting a chance to go to state. 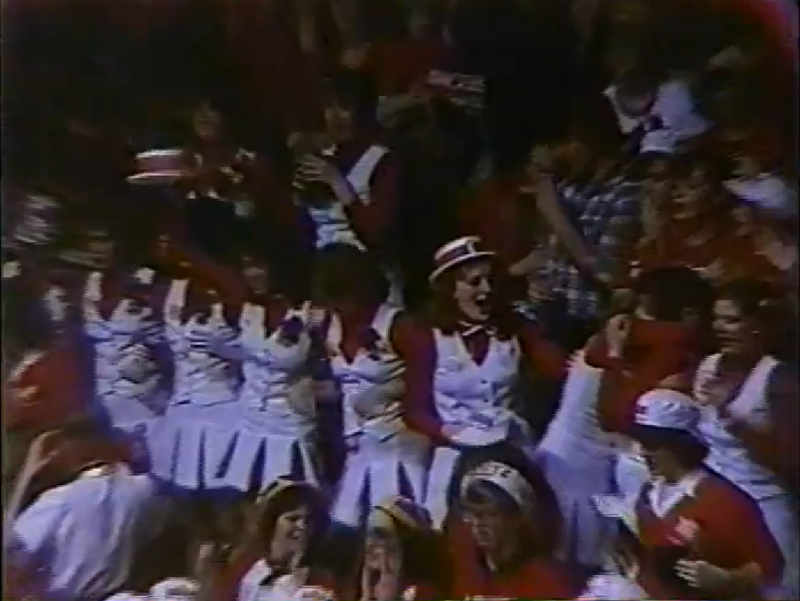 The La Follette’s band’s contribution to the scene was frantically playing the school fight song (an original creation of La Follette’s first band director) and “You’ve Said It All,” the unofficial ban on which magically disappeared for the postseason. Our band director, who never got excited for games and saved his yelling for his band (as with all band directors), was barking at an official he apparently knew. Mike Todd, who led West with 22 points, and La Follette’s Tom Luksich traded jumpers to set the score at 61–60. Derrien Jones hit two free throws to push West’s lead to 63–60, before Amundson rebounded his own miss to cut the lead to 63–62 with 17 seconds left. Then Scott Hogan (who had the same piano teacher with me) stole the ball and was fouled with 11 seconds left. The people who seemed least bothered by all this were the La Follette players. Olson had specific rules for his team — short (by ’80s standards) hair, wear hats outside, and be in bed early. He also wanted his players to play on an even keel. There were none of the histrionics you see in high school games today upon big plays or fouls being called on incredulous players. 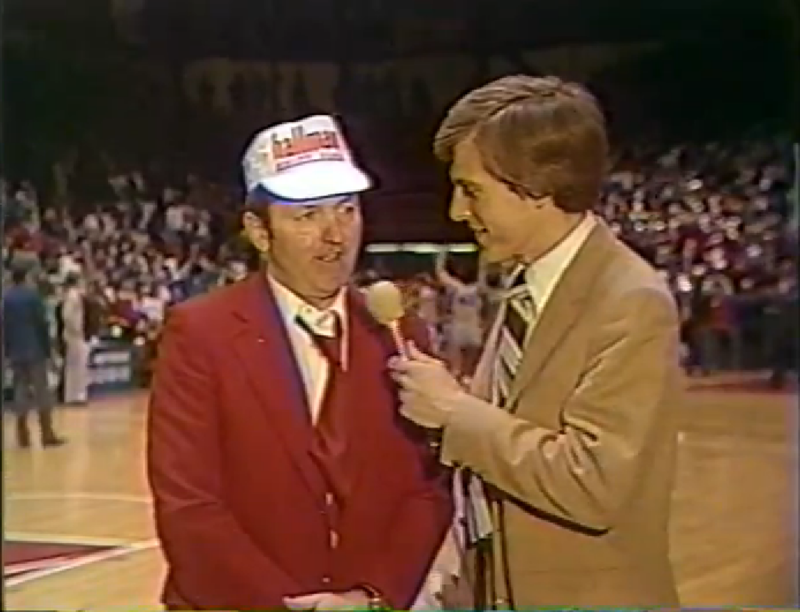 So as the walls in the gym were bowing outward from the pressure inside, Hogan stepped up to the free throw line, his season 11 seconds away from ending. Just when you thought the gym couldn’t get any louder, Hogan hit his first free throw to tie the game. Just when you thought the gym couldn’t get any louder, Hogan hit the second free throw to give La Follette the 64–63 lead. Five seconds later, a West player was called for traveling. The fact that Luksich missed a free throw a few seconds later was academic because West had no time to do more than heave the ball in the general direction of the other basket. I doubt anyone heard the buzzer, because the floor instantly filled with screaming, celebrating La Follette fans (including one trumpet player who jumped onto the floor and then had to fight to get back into the band to, you know, play), dancing around dejected West players, whose season and in several cases high school careers ended abruptly. I saw Olson (who was my gym teacher that semester and my freshman year — the first teacher to ever give me an A for gym because he rewarded effort, so I decided to give effort) not long after the game. It was the first time I had ever seen him smile. The sectional final game against Big Eight rival Sun Prairie the next night wasn’t as exciting or as well played. (And again not witnessed by me — damn work.) But La Follette beat Sun Prairie to get its third state berth in six seasons, and the second in my time at La Follette. La Follette beat Milwaukee North 65–61, which postponed the algebra-trig assignment to Monday. I thought that La Follette had lucked out as well because Brown Deer, which seemed like the better team in their quarterfinal, lost to Badger 50–48. Whether my assessment was right or not, that’s how it worked out, because the Lancers beat the Badger Badgers (really) 62–57 to go to the state championship. On the other side of the bracket was undefeated and number-one-ranked Stevens Point, which beat South Milwaukee 51–43 Thursday night and then, while an ice storm raged outside, beat Shawano 39–38 Friday night. I watched that game on TV, which was interrupted in the middle of the frantic fourth quarter by the dramatic announcement that roads were so bad that fans should not try to head back to Stevens Point that night. The next morning, members of the La Follette baseball teams, who were having preseason practice, were running through the hallways of La Follette when to their surprise they reached the Commons and found it full of basketball fans … from Stevens Point. The Fieldhouse wasn’t usually full for the Class A championship game because it was just one game, not two (which means only two teams’ fans, not four, were at the game), and because Milwaukee teams had won the previous three Class A titles, and even then Milwaukee teams did not draw well. On this night, the Fieldhouse was filled to capacity. 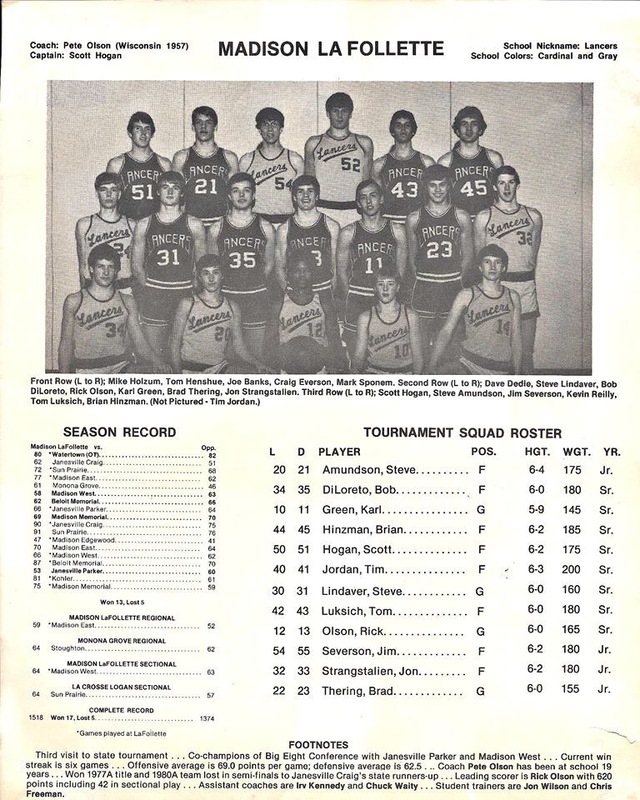 This was one of those rare occasions for which no media hype was necessary — the season-long number-one-ranked team against a team that featured the state’s best player, Rick Olson, who was unrelated to his coach. Olson was one of three Lancers who would play Division I sports; he went to Wisconsin, as did Tim Jordan to play basketball, while Amundson played at Western Michigan. 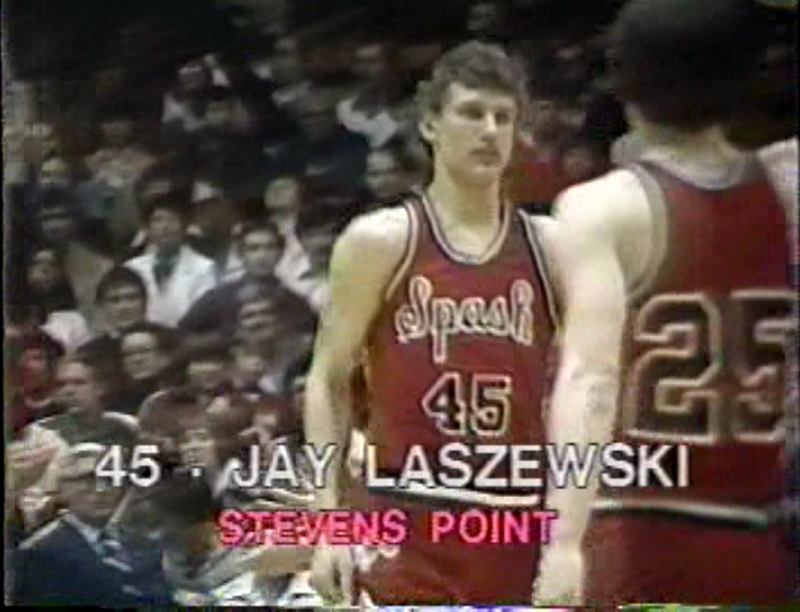 Stevens Point’s Jay Laszewski joined Olson at Wisconsin. Not only was it a media-hype-unneeded game, it was an exceedingly well played game. Without a three-point shot, both teams ran their offense but didn’t merely sit on the basketball. Defense wasn’t as physical as it is now, which makes the game more watchable. La Follette led at the half and after three quarters, and then Stevens Point took the lead early in the fourth quarter. I don’t know why we should have been surprised given the game eight days earlier, but the fourth quarter was like one long heart attack as Stevens Point’s lead shifted between one and three points. The band alternated among playing, cheering intensely, and riding the roller coaster of good things and bad things happening on the floor. After an Olson steal, La Follette tried to call time out while Olson was draining a wing jumper to give the Lancers a 54–53 lead with 2:26 left. 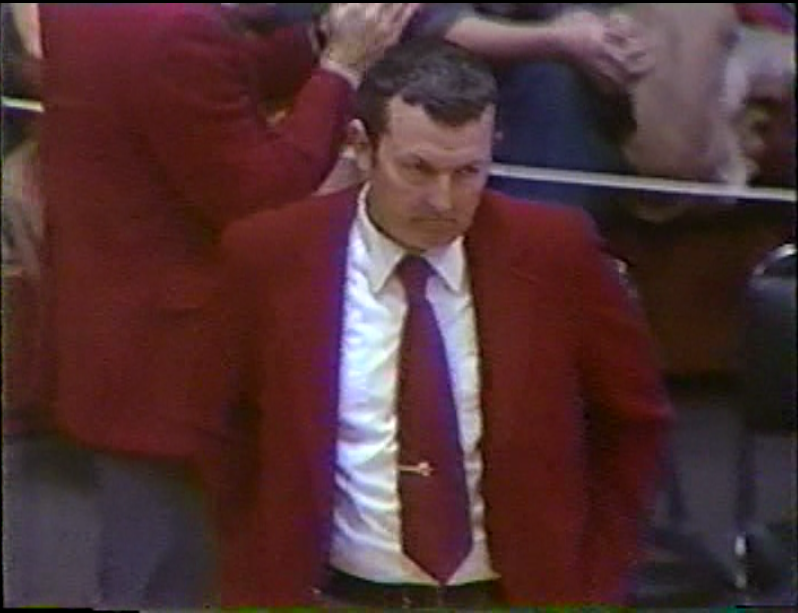 (I’m guessing coach Olson was OK with not having the time out called when he wanted it.) Laszewski hit two free throws with 1:55 left to put SPASH up 55–54. Olson hit another to put La Follette up 56–55 with 90 seconds left. Two more Laszewski free throws put Point back up 57–56. Olson drained another long jumper, the last of his 24 points, to put the Lancers back up 58–57 just before the one-minute mark. Bill Gifford hit a jumper to put SPASH up 59–58 with 45 seconds left. 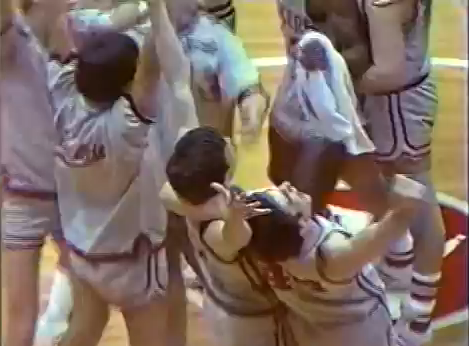 Remember Scott Hogan, who hit the two free throws to win the sectional final? Olson drove the lane but instead of shooting fed Hogan underneath, and he scored to put La Follette back up 60–59 with 30 seconds left. And then with 18 seconds left, Stevens Point’s Todd Barnes threw a pass over Laszewski, giving La Follette the ball and the lead. Olson dribbled the ball and then passed to Amundson, who was fouled with 4 seconds left. Amundson hit his two free throws, the last of his 24 points. The final basket at the buzzer left La Follette up 62–61 and lit up the opposite end of the Fieldhouse. Sir Lawrence Lancer, nickname not Fighting Bob. Band sweater? Check. Paint hat (a La Follette tradition since the ’77 state team)? Check. Sunglasses at night? Check. 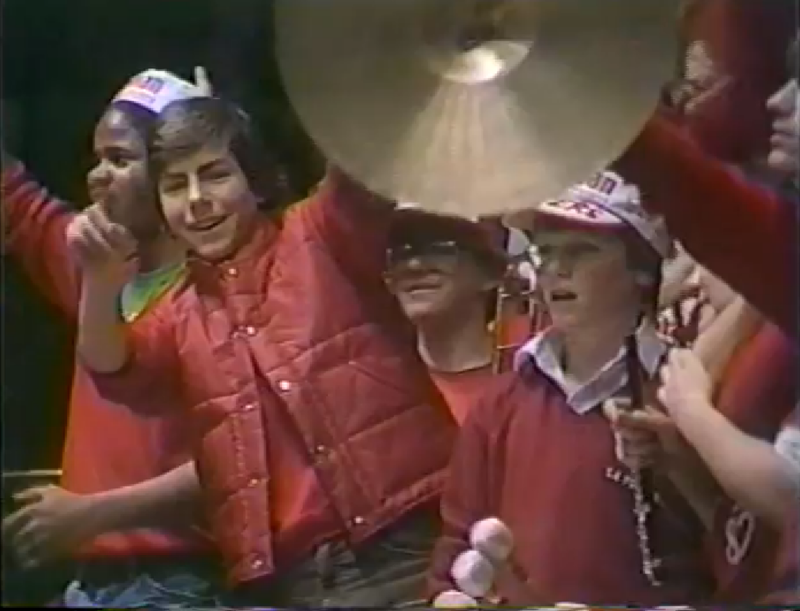 Thirty years later, you’re reading the writing of this La Follette Band trumpet player. Olson also tweaked Shapiro in a question about La Follette’s staying in the man-to-man defense by replying that the Lancers did play some zone — “Shapiro must have told you that because I don’t think he can recognize a zone from a man-to-man.” To that, Shapiro replied “He’ll never get a 40-pound muskie on that lake of his in Boulder” Junction. The game was followed by a wild impromptu celebration in the La Follette Commons, where the stranded Stevens Point fans had stayed one night earlier. That was followed by a party at my girlfriend’s house. That was followed by a more formal celebration the following Monday afternoon, pushing back the dreaded algebra-trig assignment to Tuesday, one week after it was due. The La Follette band moved from playing at state to our Wind Ensemble tour to Chicago. (About Wind Ensemble tours, all I’ll say: What happens on tour stays on tour.) Those of us La Follette juniors who went to St. Dennis Catholic Church got confirmed shortly thereafter, followed by the happy teenage ritual that is the Junior Prom. La Follette seniors, including most of the team and my girlfriend, graduated. It was a full semester, to say the least. I wonder if Pete Olson and his players and assistant coaches realized the impact they had on the rest of their school. Coming from a high school of 2,000, I can say that I knew most of the players, but I wasn’t friends with any of them. A school the size of La Follette has room for plenty of groups; mine was the band, followed by those who worked on the student newspaper, the Lance. (Which, as you can imagine, covered state very well, thank you. It was a good semester to be the sports editor.) But with all our separate interests, for one week, most La Follette students had one thing in mind, and you’re reading the culmination of it 30 years later. In the years since this, I’ve announced the games of two state champion football teams here in Ripon, covered three other state champion teams, and covered other teams that got to state. Being in the media, you’re an outsider, of course, although if you’re the local media you’re an invited outsider. 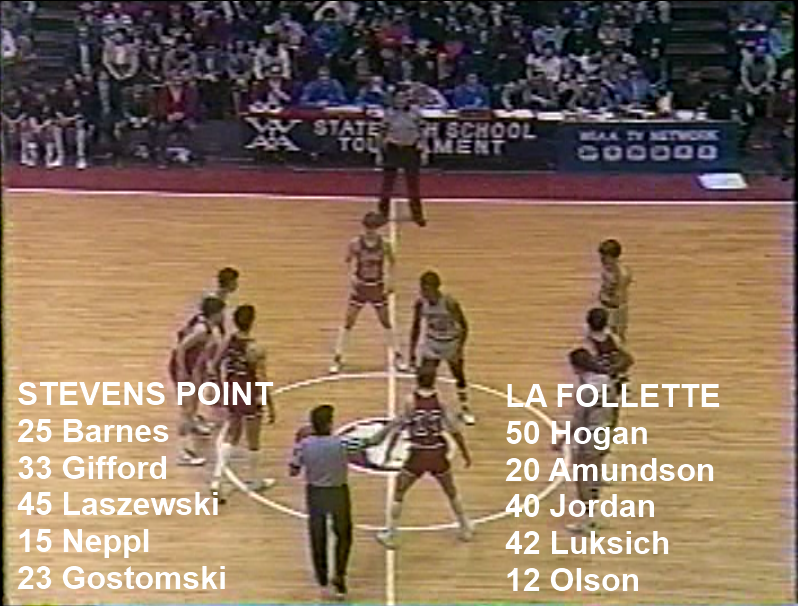 Stevens Point players and fans have different memories of this game, of course. And yet they discovered, and I later discovered, that as painful as losing at state is, it’s not the worst postseason game to lose. The worst postseason game to lose is the game before the state tournament (and I’ve covered those too), because everything you’ve done and accomplished fell tantalizingly short of getting to every player’s goal, the state tournament, whether in Madison or anywhere else. Losing at state beats not getting to state. I’ve witnessed how a school that gets to state — particularly a small high school — goes all out at state, and not just the players. And it always gives me fond memories of the days when it seemed as my entire life depended on the outcome of a game I was playing in. Playing trumpet, that is. Coach O still looked like that when we lost the 1991 Sectional Final to Madison West in Baraboo. Hey hey coach Olson open the door, we want the Lancers out on the floor.